Curtains? Yes, Goldilocks (me) and the three shower curtains. 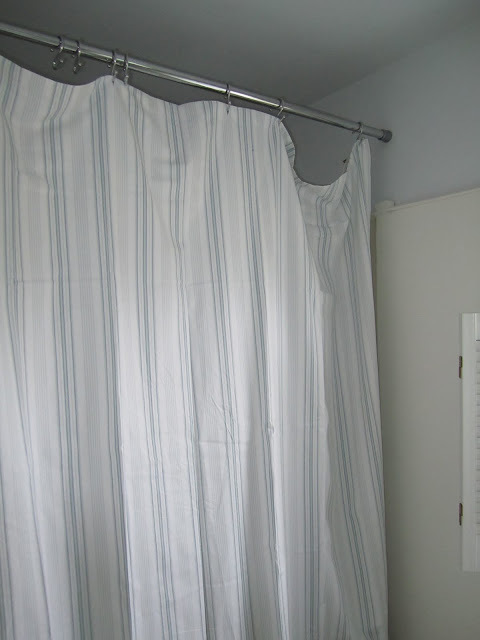 As I mentioned in the big bathroom before & after post earlier this week, the winning shower curtain was my favorite of three that I purchased. I love it, but it took a little trial and error in settling on the One. I searched high and low for the right shower curtain. I figured I would start at Home Goods, Marshalls, TJ Maxx and see if I could find a really great deal. No luck. I also had a coupon at Bed Bath and Beyond, so I gave that a whirl. Nada. 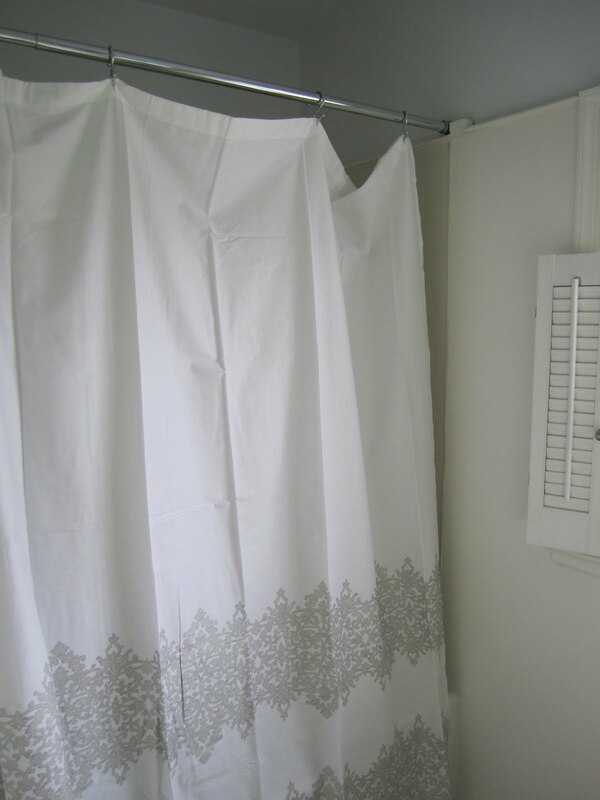 I really wanted a subtle pattern with a lot of white in it, but not a solid white curtain. So I ended up where I always end up: Target. Target has two whole aisles of shower curtains. Yippie! I meticulously combed through every section of the aisles and found three that I really liked. Rather than try to decide right then and there (oh the pressure!) I decided to bring all three home, give them a test drive in the space and then return the two that did not make the cut. Of course, my husband was like OMG when I told him I bought three shower curtains, but he quickly recovered when I assured/promised him that I would only keep one. Here are the castoffs and, finally, The One. Note: because I was only testing out the curtains temporarily, I did not take the time to hang each and every hook. I just needed a feel for how they would look in the room. End caveat. 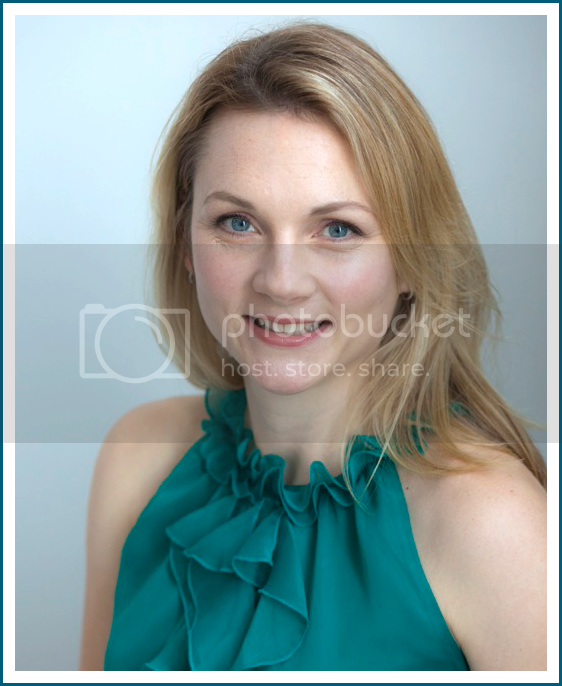 This one was easy: as soon as I put it up, I knew it wasn't right. The color was perfect and the stripe was really cute, but it felt too masculine and blah in the room. I wanted something a little more pretty and a little more sophisticated. This one was a lot harder. So hard, in fact, that I thought it might be The One and had it hanging for almost 24 hours. I liked this one a lot. I really loved that beautiful print and how it managed to bring in both the white and the soft blue in the room. But after living with it for awhile, I began to realize that the print, while subtle, totally overwhelmed my small bathroom. It ended up closing in the space and making it feel shorter and smaller. So as much as I loved it, back in the packaging it went. And here she is! The second I put this one up, I knew it was what I wanted. It was pretty, sophisticated, subtle, had enough white to feel clean and bright, but wasn't so white that it was impractical for how we live. 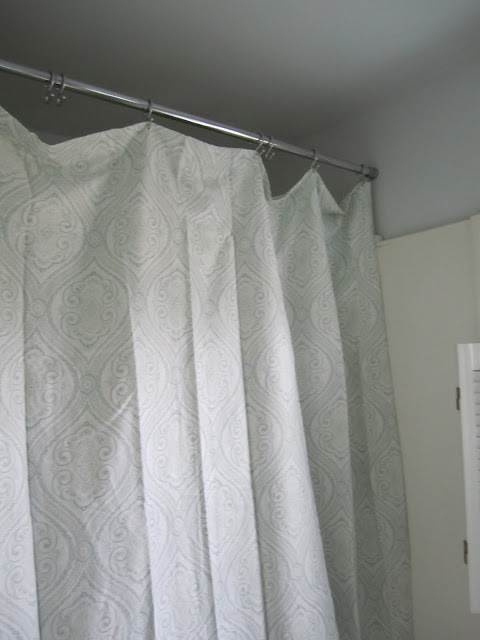 I love that the curtain is very light and airy, which is always a plus, and I figured that when I was using the shower, because it was on the sheer side, it would let in a lot of light. There is just enough white and just enough pattern to really finish off the space. Love. Yes, I love the one you picked! I might end up with it, too, if the Anthro one does not work out.